With the concert film Duran Duran: Unstaged (2011) David Lynch produced a true movie theater experience. This is not a film to be watched on a tv; this deserves a space which brings people together, as a live concert would. On September 10th, 2014 the film was shown theatrically for one night only and the reception at the Tivoli Theater in Kansas City, where I viewed it, was electric. Never before have I been to a film in which the audience danced, sang along and clapped like it was a live show. I went in as a Lynch fan and left incredibly impressed by Duran Duran’s musical prowess and their legions of devoted fans. The first thing I noticed which was different from other films was crowd noise pumped into the theater previous to the movie starting. Lynch specifically had the murmur of a live audience playing as people were taking their seats, to set the mood like an actual show would have. Then the lights went down and the film came up with no previews. 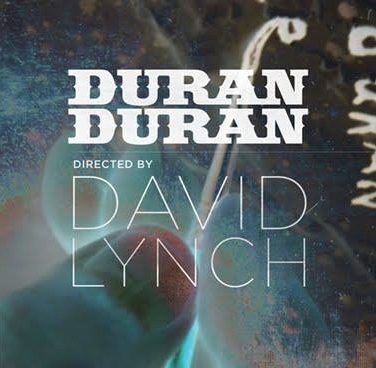 The beginning showed Lynch filmed with a swaying camera and him speaking about having many dreams about Duran Duran. Then he said something to the effect of “When I snap my fingers, the concert will start”. He snapped and then the fun began; the stage filled with the members of Duran Duran and the concert started. The show itself was a very tight set featuring guest artists joining the band(Beth Ditto, Gerard Way of My Chemical Romance and Kelis) and Lynch superimposed images over the band and sometimes completely obliterating them, showing the images alone. This sounds like an easy and cheap concept, yet it worked splendidly. The Duran Duran fans were super stoked and literally sang along with every song. I, as a casual Duran Duran listener, was mesmerized by the images, the music and the enthusiastic audience reception. Before the film, I thought it would be a bit of a goof; within one song I was totally convinced that this was a great idea. The images which Lynch used were sometimes very literal and sometimes completely absurd. During the song ‘Hungry Like The Wolf’ illustrations of wolves were flashed on the screen. During ‘Ordinary World’ a stream of blue exhaust cascaded from the side of the screen over the band. This was very simple, very fitting for such a lovely song. During the interstitial pieces when Simon Le Bon would banter with the audience and his band mates, fire was often superimposed over his talking. What the symbolism of fire over Le Bon talking is, I have no idea, but that was not the wackiest image of the film. The high-point of the film was when the band played ‘Come Undone’. If you recall the music video, well, Lynch’s interpretation was leagues away from that. I believe he took the lyrics “Can not forgive from falling apart at the seams” literally. The images which were placed over this song included a charcoal barbecue grill, filled with hot dogs, being methodically hit with a spatula. Also stuffed animal mice and other puppets mouthed the lyrics. Those images surely do lend themselves to the idea of ‘coming undone’ mentally and were unexpected and highly amusing. I am pleased that I was able to experience this film with a theater full of people. David Lynch and Duran Duran created a unique theater experience; something that will not be replicated ever again. Truthfully, since I am not a Duran Duran super fan, I would have watched a little on DVD and probably would have become disinterested after a few songs. With this special event, I was drawn into the joy of the fans and also the quality picture and sound design. It was as near to a real concert as one can get (minus the obligatory can’t-handle-their-drugs collapsing fan) plus the added absurdity of Lynch’s vision. A strange and unusual pairing David Lynch and Duran Duran may have seemed, yet it sure did turn out to be a whole lot of fun.